For this two-day intensive lab, as part of This Way Up 15, AND invited teams of filmmakers, information designers, developers, data visualisers and hackers to create visually rich and critical prototypes/projects which examine how archives (moving image) are not only a means of conserving the past, but for transporting the present into the future. How can we draw out alternative narratives, hidden histories and create a discourse around authorship & identity? What or who might be missing or buried in the depths of the vault and whose voice do we want to hear now? This lab was the beginning of a conversation. It was a space to glean new material and look closer at the challenges and opportunities that archives and big data aggregation present. We encouraged projects and approaches which explored the following: gaming, data visualisation, interactive documentary interfaces, sound triggered associative archival media, location based data over narrative, artworks and search engines. 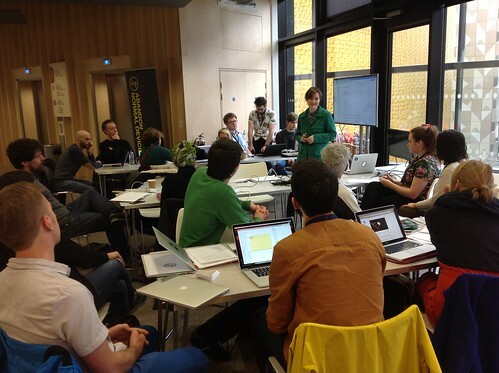 The data sets available during the hack included a contribution from the North West Film Archive at Manchester Metropolitan University. Take a look at our blog to find out more about the projects that were developed during the hack.